On my porch. They are straight up backyard apples from a friend's house. I called to ask about what kind of apples they were and was told "They came from Dad's old tree out by the gate." Faced with that, it's time for a real application of the cook's art. First, I ate one. There was firm texture, lots of crisp, a sudden tart bite which was followed by a delightful apple flavor. It was wonderful, I took another bite and said "Pie." When making a pie out of apples this way, from a box on a porch I figure it's time to use every sense at my command. This won't be a recipe listing ingredients and proportions. I was going on taste, smell, feel, and looks. When it tasted, smelled, felt and looked right I said "Ok," if it didn't I tried to figure out what was lacking. Assembled on the counter were Wondra® gravy flour, distilled vinegar, almond extract, vanilla extract, ground cinnamon, cloves, ginger, whole nutmegs, white sugar, brown sugar, maple syrup (the real stuff from a tree yo), unsalted butter. I know there's a can of butter flavor Crisco® sitting there. That's leftover from making the crust dough. Which means, of course that the first thing to do is to make up enough dough to make two crusts. Once it's mixed up stick it into the fridge to keep it cold. Peel, slice, and core the apples. These felt like they were fairly firm fleshed so I went with slicing about eight slices to an apple. Thinner slices cook faster, but I was loving the secondary wave of great apple flavor from these so I wanted fairly thick slices. I wanted them to hold the integrity of their applehood. At the widest part they were about 1/4". As soon as I turned them into the bowl I sprinkled them with the distilled vinegar. 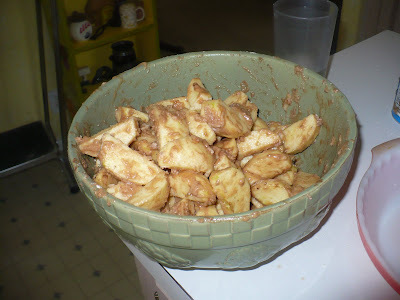 This was because I was out of lemons, a little vinegar, a little lemon juice keeps the apple slices from discoloring. It also provides a nice countrpart to the sweetness of the ingredients to follow. 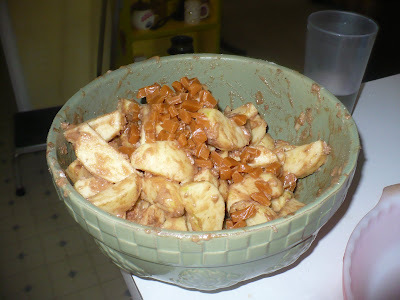 Toss the apple slices with the flour, sugars, spices and such. Again, I was going totally by feel, so I'm not sure what the measures were. 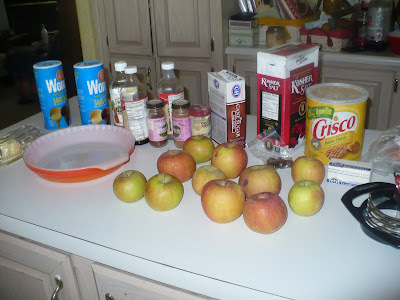 Flour was the most, I wanted that to soak up the juice as the apples baked, the sugars were about even, more cinnamon than nutmeg, more nutmeg than ginger, more ginger than cloves. A splash or two of almond and vanilla extract. Taste and adjust. Then, a moment of inspiration. I don't get those that often, when they occur, I try to follow my muse where ever it takes me. 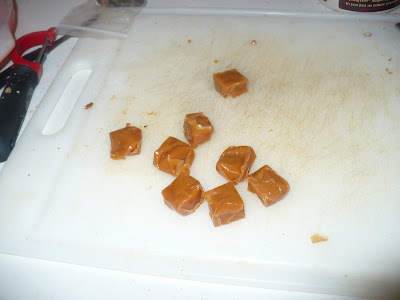 I was futzing around the pantry and I came across a bag of petrified caramels. Rock hard they were. Then, I had that moment. The internal dialog was like: Dude, caramels, whoa, hard, I can chunk them though, that's right, mix in caramel chunks with the pie, it'll be the bomb and stuff. I think that's eight or something like that. I zapped them in the microwave for fifteen seconds, and diced them. Then, into the bowl for a nice little tossing. 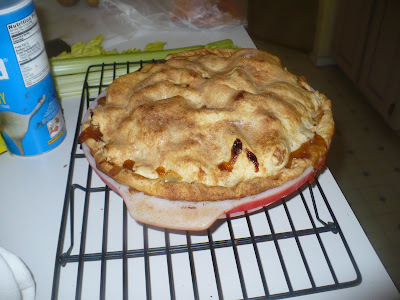 When I had the top crust in place I brushed it down with a mixture of 2 tablespoons maple syrup and 2 tablespoons water, sprinkled that with a little fine granulated sugar (C&H Baker's Sugar). Baked at 425° for 30 minutes, put a foil ring on top of the crust edge, baked for another 10 minutes. 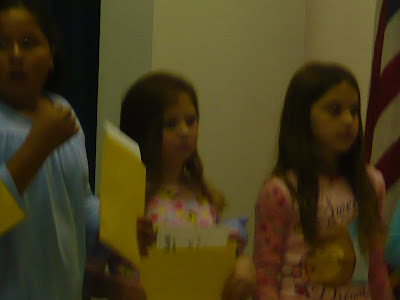 After that it was off to Dani's school to watch her get her Honor Roll Certificate, and her award as "Student of the Month." As she was tearing into her slice of still warm from the oven pie, Dani said "You should call this Caramel Apple Pie."